How getting The First 100 Days ® right can create lifelong customers, a unique day on the ocean you’ll never forget, and the difference between a good salesperson and a great salesperson. How one company blended information, fun, and experience to create an unforgettable day on the ocean. Why being a great salesperson means being a good person. Why customer retention is one of the best investments you can make. Dan’s mom was a little skeptical of Joey when she heard he went ax throwing, but now Joey has taken it to the next level: shark tagging. You catch a shark, bring it on to the boat to take measurements, take blood samples, install tracking and monitoring devices, and then let them swim away. Joey got to take part thanks to Austin Gallagher and his team at Beneath the Waves. We look at how Beneath the Waves blended information, fun, and experience to create a completely unforgettable day on the ocean. Make sure you take time to educate your customers. Don’t just tell your customers that you’re committed and love your product or service, show them. Make interactions into an experience. We stumbled across “Don’t Be a Good Salesperson, Be a Good Person,” from Sami Halabi and only later realized it was hosted on the Oracle Smarter CX website, our (fantastic) sponsors. This article looks at what separates good salespeople from the exceptional ones, and why personalization and creating an experience is key. Good isn’t enough anymore, you need to exceptional. Making the switch from good to exceptional is simple but hard, but the ROI is incredible. Focus on gamechanger behaviors that make you stand out in a crowd. 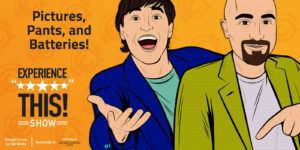 Joey has been reading, and rereading, and rereading various of a new book called Never Lose a Customer Again: Turn Any Sale Into Lifelong Loyalty in 100 Days, by none other than… Joey Coleman! After almost 20 years of consulting and speaking about creating remarkable experiences, Joey is writing a book to condense his knowledge and help you do the follow-up to turn a new sale into a customer for life in The First 100 Days. Listen to the end for a secret offer just for listeners. 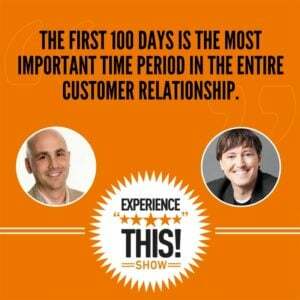 The First 100 Days is the most important time period in the entire customer relationship. Your customer has the chance to go through 8 phases in the customer relationship, but most businesses only pay attention to 3 or 4. Customer experience and onboarding are vital to all companies, no matter how big or how small. The onboarding experience is what makes or breaks the customer relationship. According to research by Bain and Company and Earl Sasser of the Harvard Business School, just a 5% increase in customer retention can lead to an increase in profits of between 25 and 100%. It’s easier to keep the customers you already have than to spend time (and money) acquiring new ones. In the rush to create CX in the digital world, don’t forget about the 54% who like to be on the phone. Speaker 1: Get ready for another episode of the Experience This Show. Join us as we discuss the breathtaking experience of tagging sharks. Salespeople who are actually good people and secret access to unpublished books. Sharks, salespeople and secrets, oh my. Joey: Sometimes a remarkable experience deserves deeper investigation. We dive into the nitty gritty of customer interactions and dissect how and why they happen. Join us while we're dissecting the experience. Dan, is it okay to talk about briefly about your mom? Dan: Hey, hey, hey, hey, hey, hey, this is my mom we're talking about here. Behave yourself. Joey: All right, absolutely, always, always. I would never dream of being anything but kind to your mom. You shared recently that she had listened to a past episode, yay, thanks for being one of our listeners, Mr. Gingus and she texted you about me. Do you care to share that text with our listeners? Dan: Well, yeah. It was one of our early episodes where you admitted to people that you had gone axe throwing, so my mom writes to me and I quote, "So, your podcast partner is an ax thrower, hmm", with a smiley face. Joey: I love it. Yes, indeed. I am an axe thrower, Mrs. Gingus and after a recent experience you can add shark tagger to my experiential resume as well. Dan: I'm sorry, did you say shark tagging? Joey: Yes, indeed. Shark tagging. There is no way your mom is gonna let you hang out with me anymore, Dan. Dan: That is absolutely true. Dan: I think this podcast is over. Joey: Yeah, it's one of those things where like, you know when you're growing up and you mom says, you're known by the company you keep. You shouldn't hang out with that bad boy. Yeah, when she finds out I was shark tagging, not gonna happen. It's over before it's even started. Dan: But, the first thing though is, what exactly is shark tagging? Joey: All right. Shark tagging is a scientific process that I got the chance to experience thanks to my new friend, Austin Gallagher and his team at Beneath the Waves. Austin leads a team that includes a bunch of scientists and he took a bunch of entrepreneurs, which I was lucky enough to be one of them with questionable levels of sanity, out into the ocean off Nassau in the Bahamas. We proceeded to catch sharks, bring them up onto the boat, take a series of measurements, pull some blood samples, install some tracking and monitoring devices and then let them back into the water to swim away. Dan: Whoa, okay. So that sounds intense and a lot of activity with sharks. How long did all this take? Joey: Well, once we caught the sharks and reeled them in, their total time on the boat, out of the water was about five to eight minutes each, depending on the size of the shark. I should also say for all of our listeners that might be concerned about the health and the welfare of the sharks, during this time we were doing everything possible to keep the shark calm and properly hydrated, which basically involved pouring bucket after bucket of water over the shark and if I'm being honest, the scientist in the process. So everybody pretty much got soaking wet. Dan: Aha, I think I finally figured out your role in this process. You were the water boy. Joey: You my friend are correct. Yes, indeed. That was the role that I got to play and it was probably the thing that I was most qualified to do of all the activities that were happening. Dan: Okay, in all seriousness, this sounds absolutely incredible. Can you give us some more details? Joey: Yeah. It really was. I mean, this was definitely one of those experience that I will not forget. It was not only in many ways an eye opening experience, but, a very adrenaline filled exciting experience. Here's a couple of things that were really interesting about it. Austin and his team were so welcoming. We learned a ton about sharks. We got to contribute to cutting edge research on one of the most important animals in the ocean and I was able to get a much better understanding of the misunderstood animal, the shark. The Beneath the Wave teams did an incredible job while we were out there of blending experience with information and fun and combining everything into a day on the ocean that, to be frank, I'm never gonna forget. Not only will I not forget anytime soon, I'm never gonna forget. Dan: All right, so c'mon, delve into the details. What was going on out there? Joey: All right, all right. This is one of those examples where we're gonna be dissecting the experience. So, first, Austin got us all together to do a briefing on shore, explaining the scientific process behind the tagging, sharing data from some of their past expeditions, and setting expectations for what it would be like to be out on the water with these incredible animals that a lot of people are afraid of. Then, he did another briefing before we got on the boat so we took some buses to the water and right before we got on the boat he explained all of the safety precautions that his team had taken and walked us through where on the boat we would be standing, how we'd be getting involved, when they would kind of call us forward to participate, the timing and sequence of the event. He really kind of outlined everything that we would be doing during our time on the boat. Dan: All right, so, it sounds like you were well informed and prepared, but, I wanna stop you for one second because I still wanna understand what's the purpose of the tagging process? Can you tell our listeners that? Joey: Yeah, so the purpose of the tagging process is, well all know what sharks are, right? We've heard about sharks, we know they're in the ocean, we know they play this really significant role. What scientists know is that sharks are responsible for maintaining the balance of the entire ocean. What I mean by that is, the fish that sharks feed on, feed on other little fish and it kind of goes down the chain. They're the top feeder in the ocean and so what's fascinating is and this is probably painting it the wrong light, but, for apex predator of the ocean to not be as understood as well as we should or could, is a big problem and with climate change and with rapidly depleting fish stocks and over fishing and increased population and coral bleaching and the death of coral reefs and all these things that are happening in the ocean that are incredibly important and are impacting the entire planet and everyone that lives on the planet. Sharks, they believe, are a secret key. If we can watch what's going on with the sharks we'll be able to have a better understanding of the ocean in general and so the whole tagging process is about putting monitors on the sharks that allow them to track how the sharks navigate through the water, where they spend different months, how far do they go? Do they come back to certain places? One thing that they don't know that Austin shared with us, they don't really know if sharks have their babies in the same area every year or in different areas or if they have them out in the deep ocean or the shallow waters. There's a lot of major questions that you think we would've figured out by now, given how long humans have been fascinated with sharks, but, they haven't. So, that's the purpose and Austin and the team at Beneath the Waves, forgive me if I've just grossly oversimplified what you're trying to do with your research, but that was kind of my take away as to why this is important and why we needed to pay attention. Dan: All right. To be fair to our listeners, this is not a science show. This is a customer experience show and so we are not claiming to be scientists here. This sounds fascinating and it sounds like an incredible experience and what I love is that they've clearly shared with you the background in the science and the reasoning and frankly why they are so committed to all of this research and that's obviously important 'cause you are the customer in this case if I can sort of bring it back to what our show's about in the sense that they're taking you out on this trip and they're showing you what it is they do and when you see that the people who are running the show, that they're not just bringing you on as a tourist, but, that this is something that they're really committed to and interested in. I think that it sort of gets you more interested in it. Joey: Absolutely. Any time you get the chance to experience someone working in their zone of genius or working in something that they feel incredibly passionate about it's going to be a captivating experience and as if these folks verbal stories and their commitments and the things that they told us about why this was important wasn't interesting to me enough, watching their diver photographer, Sammy jump into the ocean with an underwater camera every time there was a shark on the line, was proof of their total dedication to the cause. Dan: And you didn't volunteer for that job? Joey: I actually did and they were like, yeah, no. I was like so, do you need another guy to like help hold the camera? They were like, sir, stay on the boat. Step back. Yeah, that's pretty classic. I will say I think one of the coolest things about the experience overall was the way the scientists got the entrepreneurs on the trip involved in the process. As you mentioned, I'm not a scientist, I'm a business person. The other people that were entrepreneurs that were on the boat, they're business people and the scientist really went out of their way to involved me and my colleagues. Some of my colleagues got to take the measurements, some were recording data, some were helping with the tracking devices. 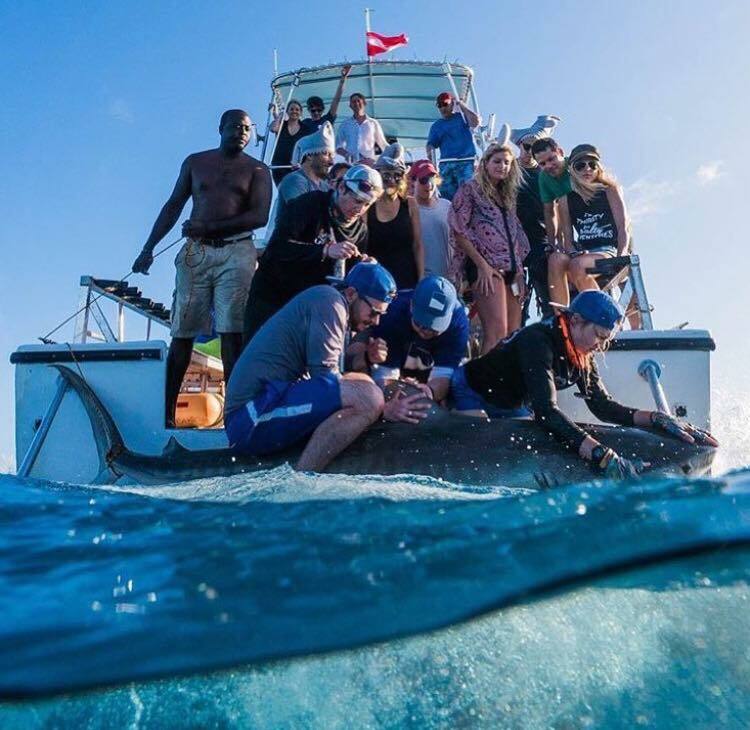 It was super cool across the board and even just watching the scientists work and being that close to the reef sharks and the tiger sharks, the two species we got the chance to work on, was not only remarkable, 'cause I'm obviously talking about it here on the show, but, it was a really incredible and meaningful experience. Dan: And I think you forgot to reiterate that some people got to be the water boy. Joey: Some people did get to be the water boy. Hey, I will tell you and I realize this may sound a little self promotional, but, my wife was on the boat with us and she noticed that the head scientist did say, the shark greatly appreciates how much you are keeping it hydrated and I was like, okay, I'm doing my job. I can do this and it's not a particularly easy job if I must say to take a 20 gallon bucket, fill it with water, get it back onto the boat, go over pour it over the shark and then go refill it and to do that straight for about eight minutes while you're rocking back and forth in the ocean and there is a shark in front of you, it was definitley one of those things where I was like, I may be making a poor life choice here, but, you know what? I'm having a lot of fun in the process. Dan: Still [inaudible 00:10:54] if you are listening, I humbly request that you start referring to your husband as water boy as often as possible. I think he deserves that, so, okay, Joey, I'm gonna have to ask, were you scared during any of this? It kind of sounds like it could have been scary. Joey: You know to be completely honest, I'm actually more afraid of lawn mowers and vending machines. Dan: Okay, lawn mowers and vending machines? I don't get it. Joey: Well, here's the deal. More people die each year from lawn mower accidents and vending machines falling over on them than die from shark attacks and not those two things collectively. Either of those things, so, the number of people that die from a vending machine fall over on top of them is greater than the number of people who die from shark attacks annually on the planet. It's just that shark attacks find their way into the news and there was this terrible PR incident known to most people as the 1975 movie, Jaws that convinced several generations of movie watchers that sharks were bad. Dan: Da na, da na, da na, da na, da, na, da na. I remember seeing that movie for the first time. I was at a friend's house at a sleepover and I'm embarrassed to say, I was the only kid that couldn't watch it. I was too scared and I remember sitting upstairs with him mom, chatting with his mom while all the other kids were watching the scary movie 'cause that movie terrified me. Joey: Totally and what's crazy is to this day, those two notes strike fear in the hearts of swimmers everywhere. So, what could we learn from this experience? Well, what we can learn is that sharks are completely misunderstood, but beyond that, how can we apply my experience on the water with the Beneath the Waves team to your business? Number one, make sure you take time to educate your customers. Austin and his team went out of their way to explain the importance of the work we were gonna do, the validity of the work we were gonna do and our contribution to the overall scientific community's knowledge around sharks. We were very vested in the role we were gonna play as the customers. Number two, don't just tell your customers that you're committed and you love your product or your service. Show them by your actions. I'm not saying you have to dive out of a boat holding a camera into the ocean with a shark to show that you're committed, but, let me tell you, after Sammy did that, there was no doubt that this guy was all in. Number three, make the interactions an experience. We could have learned about sharks via a Power Point presentation and that would have been informative and interesting and Austin and the other scientists clearly know their stuff, but, getting out on the water, having an immersive experience interacting with these magnificent creatures created something that I'm not only talking about on the podcast, but, I'm gonna be talking about for years to come. This is something I will never forget. Normally, we don't do this on the show, but I have to say I'd love it if you'd go check out this amazing organization. To learn more about the work being done by Austin and his team at Beneath the Waves, go check out their website. Beneaththewaves.org and if you're so inclined consider making a donation. We don't ask to do that with the non-profits we talk about, but, the work that these folks are doing to preserve oceans habitats is something that the entire planet benefits from and these people are the real deal. Your donation, which ironically enough is a great tax write-off in the process, is gonna go to education and research to help us learn more about sharks and the vital role they play in keeping the ocean as beautiful and majestic as possible. The ocean is one of the best experiences we have on the planet and the folks at Beneath the Waves are doing their best to make sure that experience is accessible to not only the human beings, but, to the animals of the ocean as well. There are so many great customer experience articles to read, but, who has the time? We summarize them and offer clear takeaways you can implement starting tomorrow. Enjoy this segment of CX Press where we read the articles so you don't need to. Today's CX can be found on the smarter CX.com website. Yes, indeed ladies and gentlemen, our sponsors, but, they didn't tell us to put this article on. We found it on the site and wanted to talk about it on the show. Sammy Halabi, a former door to door salesperson who is now a member or Oracle's software sales department wrote an article entitled, Don't Be a Good Salesperson, Be a Good Person and no, contrary to popular belief, ladies and gentlemen being a good person and being a salesperson are not mutually exclusive. Dan: I think that's a fancy way of saying that you can be a good person and a good salesperson and Sammy's article will show you how. He begins noting that good salespeople focus on being good salespeople. They're transaction minded, they seek to build rapport and make the sale, but, exceptional salespeople focus on being good people. They're more relationship minded, they act to understand, relate and create a value adding relationship with the customer. Joey: Absolutely. Sammy further draws the distinction between being good vs. being exceptional by noting that good salespeople gather general company data from Google, LinkedIn and Hubers to determine the number of employees and company revenues. Whereas, exceptional salespeople learn the prospects business including their growth pains, their opportunities for growth, their competitor activities, their industry acquisitions, all the things that make up the story behind the story. Dan: I just wanted to say I did a presentation recently to some salespeople where I made this exact point and it's basically what we talk about in marketing around personalization is that if you know your prospect's business or you know something about the person that you're selling to, you're much more likely to make a connection to them than just sending a cold email or making a cold phone call. The article goes on to say that good salespeople will search their internal systems to determine which products the prospect currently owns, but, exceptional salespeople will step into the prospects mind and choose to understand what annoys them and what they care about and how their product can fix it. Joey: Absolutely and these distinctions between good and exceptional while maybe sounding obvious are not obvious in their application. I think all too often we run into good salespeople as opposed to exceptional salespeople. Good salespeople are the type of salespeople that focus on the quantity of prospect interactions. For example, you need to make 30 calls or send 30 emails every day and they want you to be reaching out to prospects at all hours of the day whereas, exceptional salespeople focus on the quality of the interactions. Personalizing each interaction as Dan just mentioned and really leading with what the prospect cares about while reaching out as strategic times not all the time. Dan: I think this is really interesting and the distinction between being a good salesperson or an exceptional salesperson is an interesting way of framing it, but, I think this comes down to what we often talk about on this show which is that when you can create an experience, people are going to like you more and be more loyal to you and there's no reason why that isn't different for a salesperson. Look, having been on the other side, the receiving side of many, many hundreds of sales emails, often times clients look at salespeople with some amount of derision. They don't want somebody selling them, but, when somebody walks in the door and says, hey, I can add value to your business and help you achieve your goals and make you look good in the process because I'm successful if you're successful, hey, that just stepped into my shoes and got my attention and makes me think that perhaps you are thinking about me as much as you're thinking about yourself. Joey: Absolutely and I worked for many years in sales and I think salespeople often get a bad rap, but, it's often a rap that is well deserved based on their behavior. Lots of times we find ourselves in a conversation with a salesperson where it feels like they've done the bare minimum of homework, that they're really more focused on hitting their quotas and selling the next widget or at the very least being able to report that they had a prospecting visit instead of actually caring about the conversation. The exceptional salesperson is the person who's going to focus on really making a significant impact on an individual prospect that they call on instead of saying, well, how many can I call on today? Dan: We've talked about this before too, but, I would add one which is that an exceptional salesperson is one that's going to stay with the client through the hand off to the execution person or the customer success person rather than just jumping to the next sale and trying to make whatever their next quota is because when that hand off doesn't happen or isn't handled well, the customer experience suffers because of it. Joey: Absolutely and you know I am a big fan of making sure that the hand off is smooth and effective. You know I often liken this to an analogy of running track. If you every ran track and field or you watched it on the Olympics or something like that, you know that is the baton is handed off. If the baton is dropped and hits the track the team is disqualified and I really wish there was a similar rule for disqualification in the world of business. If the salesperson drops the hand off to the customer success person or the account services rep or whoever it is that's gonna take this now new found customer and make sure they get what they want out of the product or service they just purchased, if that drop happened the relationship should just end. The reality is often when it does, that's the impact it has on the relationships. In terms of the CXpress article, I think there are a couple of clear takeaways. Number one, good isn't enough anymore. You really need to be exceptional. This applies to every area of business, but particularly in the world of sales. Number two, making the switch from good to exceptional is actually fairly simple. There are gonna be growing pains, but the ROI is incredible and you will have much better relationships if you focus on being exceptional as opposed to being good. Finally, number three, you can continue to execute on benchmark behaviors such as smile and dial and how many different things can we do to build our prospect list and make it a numbers game, etc. or you can focus on game changer behaviors that make you exceptional that make you stand out in the crowd. Personalize communications, putting yourself in their shoes, seeing their business from the perspective of the customer as opposed to from the perspective of the salesperson which is, how can I get your money? I don't know about you, but, being exceptional sounds much more interesting and a much better experience than being just good. We spend hours and hours nose deep in books. We believe that everything you read influences the experiences you create. So, we're happy to answer our favorite question. What are you reading? Dan: So, Joey, we haven't talked too much lately about what you have been reading. What is on your reading list these days? Joey: Well actually, Dan, if I'm totally honest I've been reading and re-reading and re-reading various iterations of a new book called, Never Lose a Customer Again, Turn Any Sale into Lifelong Loyalty in 100 Days. Dan: Wait a second. I think I've heard that somewhere. Isn't this your new book that's coming out in few weeks? Joey: Yes, indeed, my friend. You are correct. After almost 20 years of consulting on creating remarkable experiences and giving speeches about it, I'm excited that the folks at Portfolio Penguin will be publishing my first book. Very exciting times. The book is all about the importance of creating remarkable experiences early in the customer relationship so you can cerate a customer for life by having a really effective onboarding process. Dan: One of the things the experience this show does not have unfortunately is sound effects, but I would be hitting the applause button right now. I am so excited to read it because I have heard you speak and I know the jist of what you talk about, but it is so incredibly important and clearly this is a topic that I like as well. Very, very excited and let's talk a little bit about this idea of focusing on the onboarding piece because we mentioned a little bit in the last segment, but, why is that such a key component of the experience? Joey: Well, I think it's because so many companies spend time wining and dining new prospects, trying to convince them to do business and once they do it's as if the chase is over and the results aren't as grand or as fulfilling as were promised. In fact, in putting together the book I did a bunch of research and found that most companies are losing somewhere between 20 and 70% of their new customers before the customer reaches their 100 day anniversary. It's absolutely shocking to me that companies spend so much time driving business, prospecting, filling the funnel, marketing, trying to convert leads only to have these newly acquired customers refuse to stay. They're running out the back door as quickly as you've brought them in the front door because they don't feel the post sale love. Dan: That's absolutely amazing and we see how much money companies are spending on marketing and sales vs. things like customer service or retention or customer experience, so, realizing that you've got obviously an entire book devoted to your ideas about this and we don't have hours here, give us a few key takeaways for our listeners so that it's kind of a preview of what they're gonna learn when they all go out and buy your book. Number two, your customer has the chance to go through eight phases in the customer experience and yet the typical business is only paying attention to maybe three or four of these. Number three, the enhanced onboarding experiences that I'm proposing actually worked for companies of all shapes and sizes. In the book there are 46 case studies that range from solo entrepreneurs that'll do less than $100,000 in revenue to gigantic firms with tens of thousands of employees and billions in revenues regardless of where your business falls on the scale of small or large, lots of revenues or very few revenues, tons of employees or just a solo entrepreneur, there are takeaways that you can apply. Your customer has this chance to experience you and the experience they have in this onboarding process is really what's going to make or break the relationship. The entire book is focused on how can we make these first 100 days as magical as possible? Joey: Absolutely, so, in the book there is a separate chapter on each phase and each chapter not only talks about emotionally what the customer is going through in that phase, but gives five or six examples of companies that are really world class and in making the interactions and the experiences that occur in that phase truly remarkable. The phases breakdown as follows. Phase one of the new customer journey is assess. This is when the customer is trying to figure out who they should do business with. They're looking at you, they're looking at your competitors. They're looking at your number one competitor which is doing nothing right stasis, the status quo and they're trying to decide what they want to do. When they make a decision they go to Phase two. Admit. This is when they raise their hand and say, I have a problem. I believe that your product or service can solve and I wanna do business with you. They then transition to Phase three. Affirm. In common problems this is the buyer's remorse stage and what's fascinating to me is there isn't a business person on the planet that isn't familiar with the phrase, buyer's remorse, yet if you ask companies what is your strategy to address buyer's remorse, less than one in 100 have a plan to do that. There's a real opportunity here. We then move to Phase four. Activate. I call this phase activate because I really want you to feel like you're electrically charging and activating the relationship. This is the kickoff meeting. This is the unboxing experience when they first get your product if they've ordered it online. This is the first moment of truth or that first interaction they have with you where they get to see if what they were promised in the sales process actually lines up with the reality now that they're a customer. We then move to Phase five. Acclimate. This is where the company has a responsibility to hold the customer's hand while they get used to doing business with you. Whether that's using your product or navigating through an implementation of the service. You need to help show them the way and even though everything that was gonna happen was in the contract or is in the instructions, we need to recognize that our customers don't read these things and we need to regularly be reminding them of what comes next. Then we come to Phase six. Accomplish. This is where the customer accomplishes the goal that they had when they originally decided to purchase your product or service. What's crazy about this is most businesses never even take the time to ask their customers what they're hoping to accomplish. They may be make some guesses or some presumptions, but not only are they not sure but they don't do anything to feed back to that customer when this happens that they've actually reached the finish line. The thing that they hoped for all along. Then we move to Phase seven. Adopt. This is when a customer who has accomplished their goal, feel so good about your business that they say, I'm never gonna do business with anyone else in this category other than you. I am a loyal, supporter. I am in 100%. Then and only then do we move to Phase eight. The holy grail, advocate. This is where they become a rating fan referring all their friends and neighbors and colleagues to come do business with you. Across the eight phases that's the potential that your customers have to do business with you and your opportunity to not only help them navigate those eight phases, but to hold their hand as they go through those processes. Dan: I couldn't help but notice that all eight phases start with the letter A.
Joey: Nothing gets by you, Brother, nothing gets by you, exactly. They all start with A which is kind of my own little way of saying that the goal should be to get straight A's on your customer report card. This is really important and you need to be spending time in each of these eight phases. Dan: I love that. That just sounds like you, Joey too. Asking people to go out and get straight A's, which Ladies and Gentlemen Joey did through every level of school all the way up to and including. Joey: No, no, not every level, though there are listeners to our show that knew me in law school and I was the 10% that made the 90% above possible. No. No. Dan: Well, hey, I know you too well to know that you would not plug your own book on this show, so I am gonna do it for you and with pleasure. Friends, listeners, colleagues, this is a book that you absolutely have to go out and buy. First of all, I've gotten to know Joey, I've known Joey for a long time, but I've gotten to know him really well through this podcast and he is truly one of the smartest guys I know in this space and this is going to be a major, major book that people in the CX space are gonna be talking about and I think you wanna be part of this conversation. The other thing is he is identified a unique space in this first 100 days that really allows you to dive deep and learn what you can do in a practical way as we try to deliver here on this show that you can bring back to your business. Fresh ideas as examples on how you too can create a remarkable customer experience like we talk about all the time. Finally, by purchasing a copy right now which is actually before the book comes out, we can help our friend Joey pre-sell a bunch of copies of this book which I think that he's gonna be the first guy that I know that makes a best seller list at New York Times, Wall Street Journal whichever one it is and you can help. If you would be willing to do this, in fact, if you will just press pause on the recording right now. Go ahead. Right now, Joey and I will be standing by. I promise we will not go anywhere. We're gonna wait for you. Head over to Amazon, Barnes and Noble.com. You can even run over to your local book store. We may have to pause and have a beverage or something and wait for you, but, we will wait for you when you go out and buy an advanced copy of this book and help out our friend, Joey. Joey: My friend, you are too kind. I really appreciate the kind words, I appreciate the ask for our customers, 'cause you're right. I put a lot of work into this book. I'm super excited about it. My goal is to really change the way people experience business on the planet as we talk about a lot on this show. I think the bar for a customer experience is lying on the ground. We do our best to highlight the positive customer experience stories and they are out there, but, let's be candid. There are many more negative stories than positive and what you'll find in this book is story after story of how to do it right and the positive examples that I really think a lot of people can adopt and if folks are so compelled and they wanna go out and buy a copy of the book, first of all I would be eternally indebted and grateful for you doing that, but since you're kind enough to ask, I wanna sweeten the deal a little bit here. Please no one tell my publisher that I'm making this offer because they will go bonkers, but, I don't know, let's say for the first 20 people that go out and buy the book and maybe we'll do even more than that if I can figure a way to sneak it around, email me your receipt and send an email to my personal email joey@joeycoleman.com and share that you got the book and share with me your physical mailing address and what I'm gonna do is send you a advanced galley copy of the book the day I get your email. So, you'll get a chance to read the book before any of your friends in the CX space and I'd be happy to do that as kind of my little way of saying thanks for being part of the club. Thanks for being a loyal listener, thanks for being in the in-crowd and thanks for contributing your support and helping me to move a lot of these books pre-launched. This is what matters to publishers and the folks that do the list and getting books sourced to order more copies. It's when they see that there's a ground swell of people that are interested in a book, so getting out there and buying it, having your friends buy some copies, that would mean the world to me. Dan: So, that is awesome that you have extra galley copies and for people that don't know what that is, it's basically an advance copy that usually is reserved for media people, reviewers, so that you have people talking about the book in advance of it coming out and not generally are they reserved for the Joe Schmoes or I guess, I should say the Joey Shmoeys. Dan: I can't believe that I said that. Joey: See what he did here folks? Dan: This is just seriously some secret access that is not available to the general public. Joey: Yeah and this is not an offer I'm making across the board. In fact, it's just something that I'm compelled to do 'cause you were kind enough to say so many nice things, Dan. I'm all about the secret access and the fact that membership should have its privileges to pull from that famous credit card tagline or motto or ad. I believe that the awesome fans that are on our show and listen to our show deserve something special, so I wanted to give you some secret access. I'm supposed to be saving these advance copies for special people and guess what? All of you that listen to the Experience This Show are special people and you deserve special access and Dan's asking you to do me a favor and I wanna return that favor by giving you early access to the book. You're our most loyal fans. We wanna give you the best experience we can and I know it's a little bit self serving, but, I really believe that this book is gonna help you, I believe it's gonna help you get the other people in your company to buy in to creating this type of experiences and my goal is to really contribute to the customer experience conversation that so many of my friends and colleagues like Dan and others that we featured on this show have done and so this is my attempt to join in on that process. Dan: Joey has been kind enough to share some snippets of the book with me and I can tell you as a guy that's been talking about customer experience and customer service for years, this is going to be an amazing book. I cannot wait, Joey, to read the rest of it. I am looking forward to my own signed copy that I will put on my special shelf of signed books that I value quite a bit. Ladies and Gentlemen, go out there. Buy Joey Coleman's book. Amazon, Barnes and Noble, wherever you find fine books and send your receipt to Joey@joeycoleman.com. You too, can get your advanced galley copy only for listeners of the Experience This Show. Joey: Listen in. While we try to stump and surprise each other with the fantastic statistic from the worlds of customer experience and customer service. It's time to check out this number. This week's number is another range, Dan. This time, it's 25 to 100%. What do you think it refers to? Dan: I have to say I'm kind of stumped on this one because 25 to 100% is like almost the entire spectrum. I'm kind of wondering what's not included. Joey: The one to 24% is not included. Actually, what this range refers to the fact that a mere 5% increase in customer retention can lead to an increase in profits of between 25 and 100%. This comes from a few places including independent research by Bane & Company along with Earl Sasser of The Harvard Business School. Dan: Yeah, I mean, this makes all the sense in the world to me and I heard stats like this before, but maybe not expressed in the same way. It is always going to be less expensive to keep your current customers than it is to acquire new ones and those current customers are going to spend more over a longer period of time and many, many companies face the old leaky bucket problem which is they may be bringing in lots of new customers, but there's too many of them leaving every year and getting away. I think that this is a really important stat to keep in mind and bring to your CFO when he's pushing you to sell more. Tell him, hey, maybe we should focus more on the customers we have. Joey: Absolutely. Small, small improvements in retention lead to a very large increases in profits. You can learn more important stats like these when you sign up for the Smarter CX Newsletter, published by Oracle just once a month. They're not gonna be flooding your already full inbox, folks. This newsletter's a quick and easy read that shares great stats, expert insights and links to fantastic articles like the one we referenced earlier in the episode. This all comes from our great friends and sponsor of the Experience This Show, Oracle CX Cloud. Go check them out and don't forget. Go to the special url to check them out. Smartercx.com/experiencethis.